Maintaining and improving physical skills is an important health factor for the need specific and aging adult community. The Assisted Functional Trainer fitness station has limitless potential for one to engage in exercises that aid in improving the joint and muscle movement for all ages, fitness level and abilities. The station includes a plyometric box, dual hand rails and a comfort seat, this assisted functional trainer facilitates the sharpening of basic every day skills. 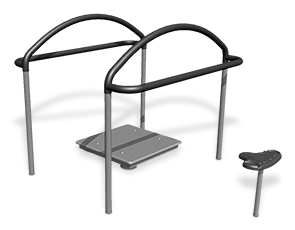 Designed for safety, inclusivity and longevity this outdoor fitness station features slip resistant surfaces, spacious wheelchairs access and durable steel construction with powder-coated finish.